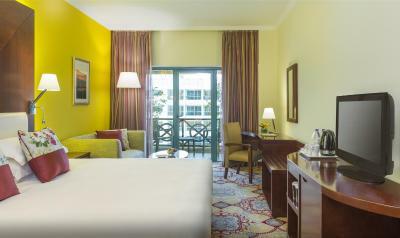 Lock in a great price for Coral Dubai Deira Hotel – rated 8.3 by recent guests! 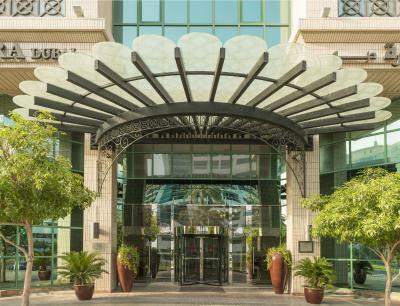 1- The hotel located in the heart of city. I give 10 out of 10 for location. 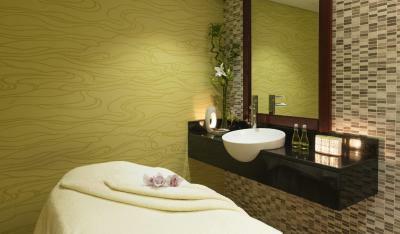 2- Staff were just amazing with their attitude and services. They are so active to serve you . I like and appreciate the receptionist Mira and Lawal for their professionalism and friendliness. The place is really secured. Reception staff especially Marianne, Mahmoud & Sayed they’re very cooperative, helpful..and Mr. Nader he was very kind and cooperative..really they are the best . Properly was fine fir the most part, nice large room, comfortable bed, great water pressure, but it was just okay. I remember things being a lot nicer the last time I stayed there. The facilities were OK but not something great. Even ice was charged !!! Amazing hotel... I can’t emphasize enough how great is the staff and this place.. 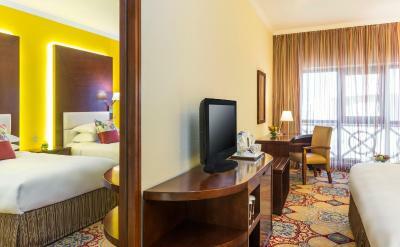 I will definitely stay at Coral Deira hotel again.. I strongly recommend this hotel. 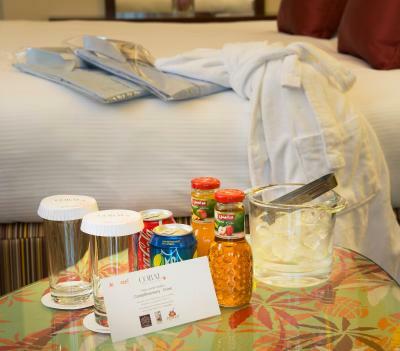 Checkin was smooth and complimentary snacks in the room was not charged as it was an executive room. Room service was quick. Very close to airport. 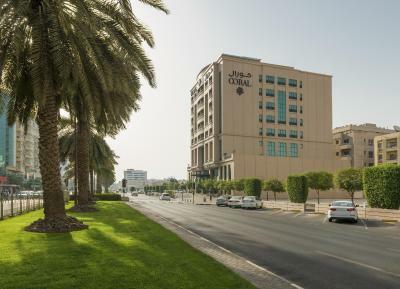 24 hour supermarket & lot of restaurants nearby..
Coral Dubai Deira Hotel This rating is a reflection of how the property compares to the industry standard when it comes to price, facilities and services available. It's based on a self-evaluation by the property. Use this rating to help choose your stay! 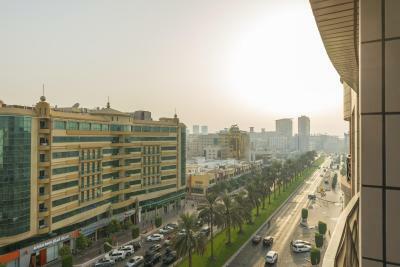 In the heart of Dubai’s central Deira district, this luxurious hotel offers free Wi-Fi in all areas, comfortable modern style rooms and a rooftop swimming pool. 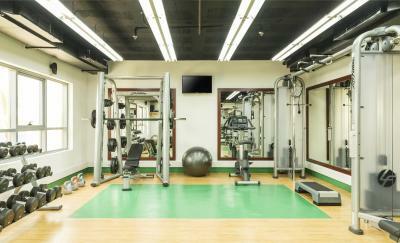 Guests have access to on-site fitness center and sauna. 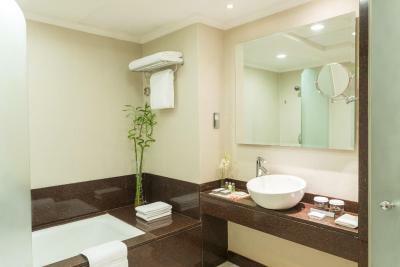 All rooms feature warm décor and well-designed bathrooms with bathtub and hairdryer. 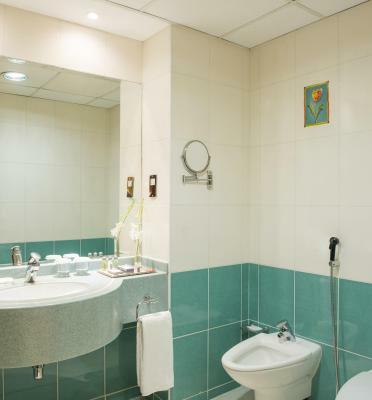 Air conditioning, satellite flat-screen TV and mini-bar are standard amenities as well as a coffeemaker. 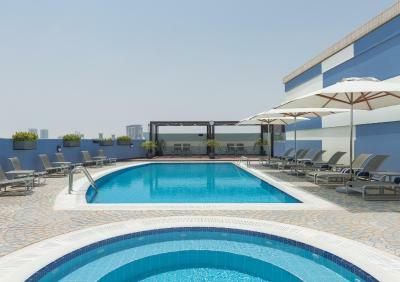 Guests can take a dip in Deira Dubai’s rooftop swimming pool or work out in the fitness center which also offers a sauna. 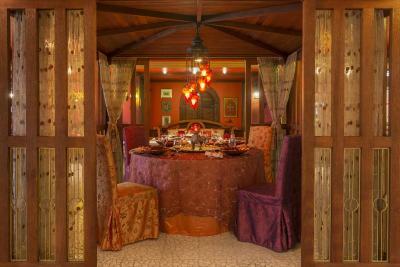 There are 3 different dining options offering local and international gourmet cuisine. Refreshing beverages, hot drinks and delicious pastries are available at the Rumors Café. 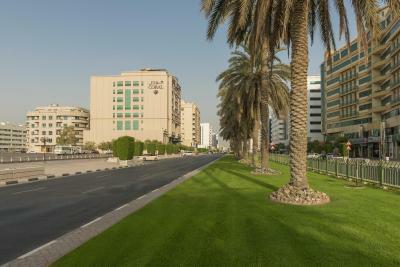 Dubai International Airport is just 4.3 mi from the Coral Dubai Hotel. 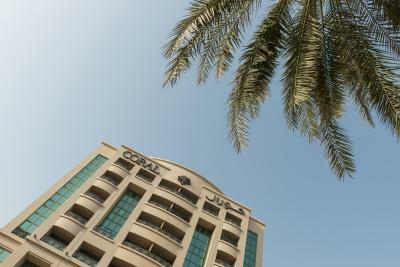 When would you like to stay at Coral Dubai Deira Hotel? 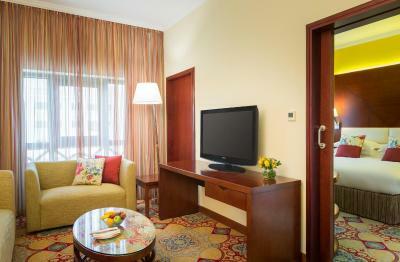 This room features a seating area with a flat-screen cable TV, a mini-bar and tea/coffee making faculties. Please note that an extra bed can be added subject to availability. Spacious suite with a separate living area. 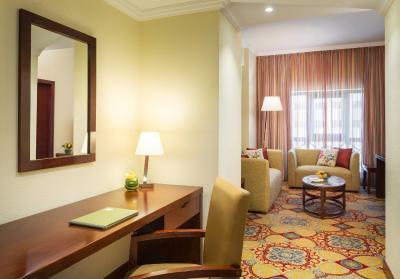 This family room consists of two interconnecting bedrooms with 1 king sized bed and 1 twin bed. 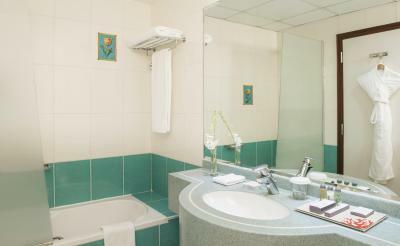 It includes 2 TV sets and 2 bathrooms which is ideal for families. 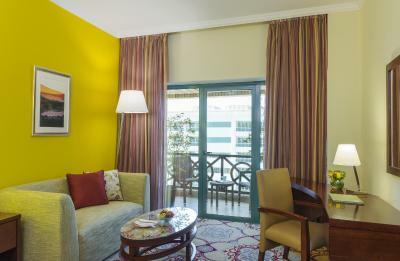 This deluxe twin/double room features a balcony with a coffee table and chair from which a pleasant city view can be enjoyed. 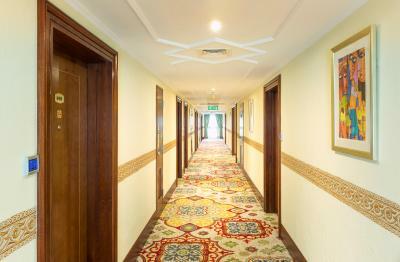 For safety reasons access cannot be provided in rooms where children are present. 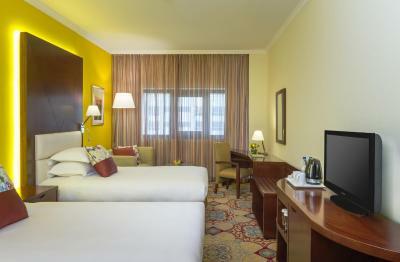 A small hotel, has it's advantages: * cosy ambience * know guests better, & serve them quicker * decision making faster * biz mantra- be easy to do biz with * Tripadvisor rating in top 85 hotels in Dubai, and awarded Tripadvisor's Traveller Choice 2016 Another reason to stay with us is the fact that all our rooms have been renovated in the summer of 2016. 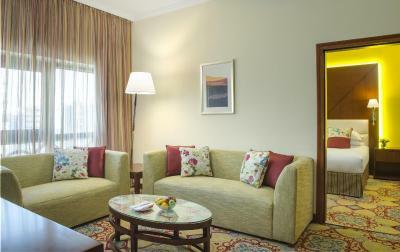 Come & experience perhaps THE newest rooms in Deira! 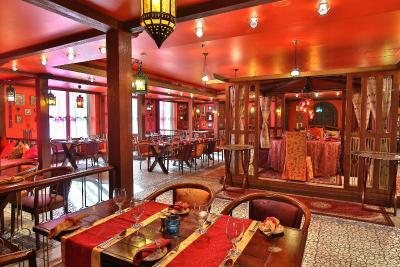 House Rules Coral Dubai Deira Hotel takes special requests – add in the next step! 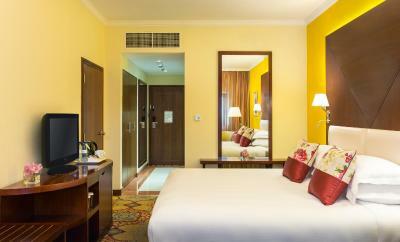 All older children or adults are charged AED 120 per person per night for extra beds. 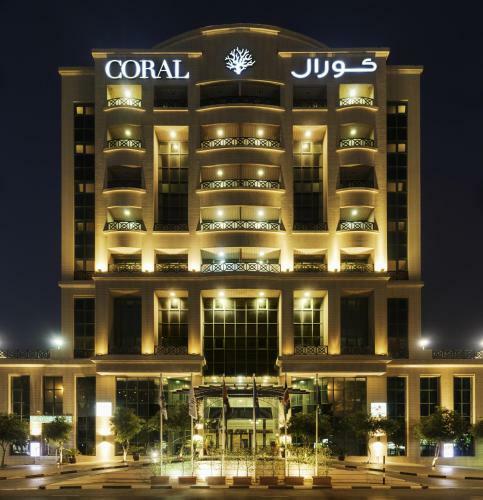 Coral Dubai Deira Hotel accepts these cards and reserves the right to temporarily hold an amount prior to arrival. 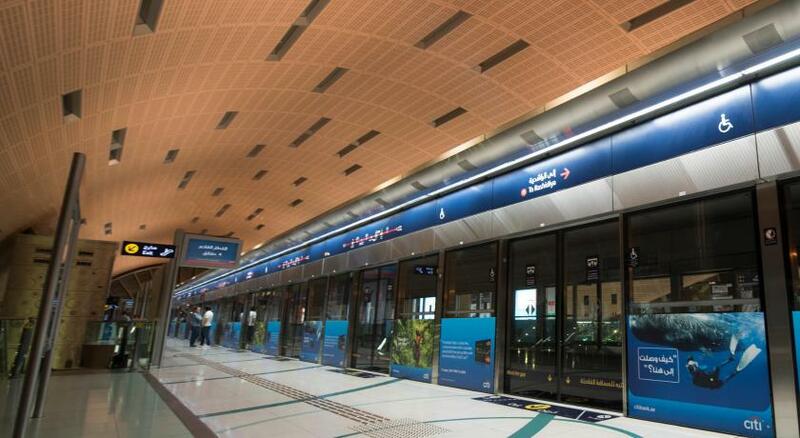 You must present an original passport or UAE Identity Card upon check-in. Please note that breakfast charges are applicable for children over 5 years. You must present the credit card used to make this reservation upon check-in at the hotel. If booking on someone else's behalf, please contact the hotel directly to arrange for third party billing. Please note that Coral Dubai Deira Hotel does not serve alcohol. Very useful location for the airport. Staff excellent. Roof top pool but didn't get time to try it. Cleaning and room service was more than expected. When we sleep at night,Its so hot in the room even AC is there,we are sweating to much. 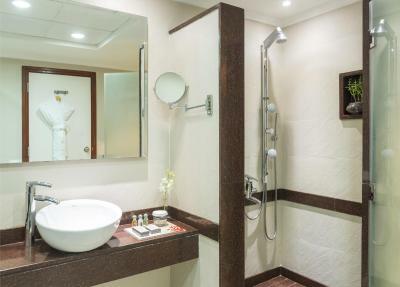 It is a good hotel with great features like LCD display for room services., Room thermostat , Wifi & Direct line Internet. 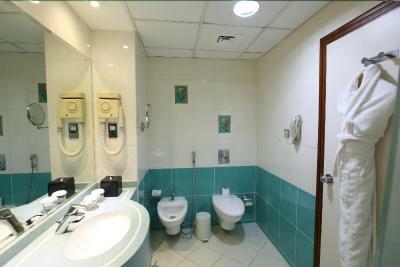 Highly maintained apartments.Spacious Bathroom. check in was a pain as I had to wait. unfortunately, my next room had heavy party candidates so I lose my sleep for a couple of days due to noise. room size, hot water facility, location. A very calm and comfortable hotel. I didn't take the breakfast. I normally woke after 10 o'clock.